We take our beers very seriously here at the Two Bridges Hotel, and can highly recommend the local Jail Ale from our own Dartmoor Brewery. As a Cask Marque accredited establishment, you can be sure of an excellent pint every time at the Two Bridges Hotel. The Cask Marque is an award for pubs, bars and hotels which serve great quality cask ale, backed by brewers, pub groups and trade bodies with the aim of improving beer quality through an accreditation scheme. Qualified assessors make over 20,000 visits a year to over 9,000 establishments which hold the award. They test for temperature, appearance, aroma and taste. All beers must make the grade to pass the visit. 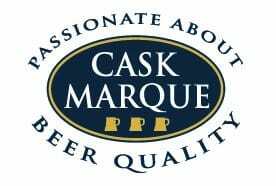 Recent independent research by Cardinal for the 2014 Cask Report identified that 71% of beer drinkers recognised the Cask Marque plaque as a badge of quality.